There was a time when all and sundry were invited to a wedding; extended families, family friends, old friends and everyone you work with. But in recent years, that’s shifted in favour of intimate weddings. Recent research suggests that couples are choosing to marry later and with fewer guests than before. The average number of wedding guests has gone down from 149 to 141 in just seven years. We’ve even seen the advent of ‘microweddings’ – these are small weddings of up to 50 guests in total. That’s not to say that small weddings are cheaper. Although they may be kinder to your wedding budget, if you are planning a luxe wedding, it simply means that you have more budget per head, which allows you to go all-out with your celebrations. 1. Why a Small Wedding? Before you even get to ‘I do’, understand what appeals to you in an intimate wedding. Is it the privacy and exclusivity it offers? Maybe it’s the preference of a more meaningful wedding that can be personalised? Or perhaps is it to do with your wedding budget, or because you want to marry abroad? Once you have established your motivation, prioritise this as your inspiration for the big day. Possibly the most important part of wedding planning is who to invite. With an intimate wedding, this means your nearest and dearest, which in some ways may be easier to decide. As a couple, agree a number that you feel comfortable with, and work towards this. Typically, a small wedding lends itself to about 50 people – that’s 25 people on each side. Think about whether you want to include ‘plus one’s’ or just individuals, and whether this extends to your close work colleagues, or none at all. Consistency on both sides will prevent arguments! Consider if you want to extend guests to the evening reception, or if you prefer to keep your wedding party small and exclusive, without the distraction of new guests later in the day. Finally, give some thought as to how you will manage friends and family not invited. One of the challenges of a small wedding, is how to manage other’s expectations. When it comes to your wedding budget, figure out how much you have to spend in total, and where will these funds come from (savings, family, etc). Once you understand your finances, you are able to work within its constraints. Couple this with your guests list, and you should be able to know the cost per head. This will come in useful when thinking about wedding venues. One of the key considerations of a small wedding, is ensuring that that the wedding venue complements the size of your party. Too big and it may look like some people didn’t turn up – too small and it could look like you’ve skimped on costs. The key to this is researching venues online and in person in advance, to ensure they work for your party size. First of all, where will you say your vows? Be it a church, a beach or a registry office, a barn or elsewhere; make sure you chose a venue that is suitable for the number of guests attending. When it comes to your wedding reception venue, there’s plenty of creative options for intimate venues. From boats to barns, boutique hotels to private rooms in restaurants. You are less restricted with smaller groups – the only venue it rules out is large ballrooms and venues accommodating bigger groups. However, most wedding venues have their own wedding co-ordinator, who will be able to advise on making the most of their space, so use them to your advantage. This is where you’ll be spending the bulk of your day, so make it a priority. The guest experience is often richer with smaller parties, as the couple is able to spend quality time with everyone. But, because there’s more focus on guests, it means that that their experience needs to be high on the agenda too. Think about how the day will unfold, and all the touches that can be added to make it feel exclusive and special, that a bigger wedding party might not be able to achieve. This might be hiring a boat to take guests from the church or registry to the wedding venue, or it could be a private chef and sommelier that offers private tasting as part of the day. 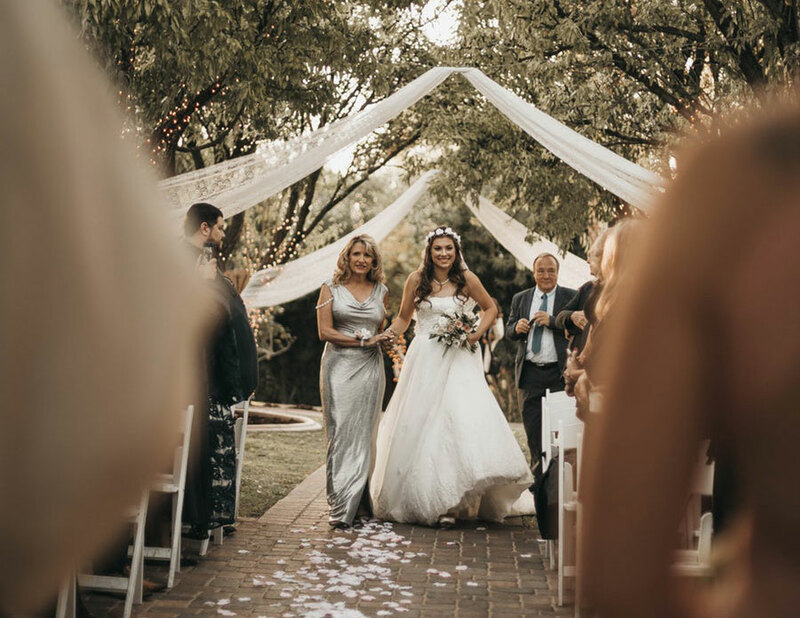 One of the many reasons that couples opt for an intimate wedding, is the option to break away from tradition and to add some personality to proceedings. With a smaller wedding party, you have the opportunity to make the day your own. With less than 50 guests to think about, it’s possible to create bespoke touches, and within your wedding budget. This might be a designer wedding cake, or pictures of everyone attending dotted around the venue. It could be as small as your colour scheme, to getting a film made that is shown on the day. The great advantage of a small wedding, is the ability to plan it on your terms. Since you’re keeping the day intimate, this means opting out of ‘unnecessary’ traditions. It wouldn’t look out of place to have one or no bridesmaids, or to forgo a large group of groomsmen. The beauty of an intimate wedding means that anything goes. A significant reason why many couples opt for small wedding parties is because of privacy. Not everyone wants a big wedding and the attention that comes with it. If this is the case, think about how your big day can be full of celebration while being appropriately discreet. You may wish to include a social media ban for instance. And finally, small wedding parties have the benefit of whisking guests away abroad or to exclusive venues, as part of their big day. This often means that guests can stay on-site, depending on the wedding venue chosen. This can be a great benefit in keeping your big day feeling exciting and a special, for a lucky elite group of guests.